BirdFest is over for another year. Those of you who were there for either or both of the two days, October 8 & 9, were, I’m sure, impressed with all of the many varied, fun, and instructive activities that were going on throughout the weekend. Many thanks to the organizers and workers for putting together another superb BirdFest. One of the activities which I think needs special note, an activity that went on throughout Sunday, October 9, was the Big Sit! For those who are not familiar with the Big Sit!, let me briefly explain. The Big Sit! is an annual, international, noncompetitive birding event hosted by Bird Watcher’s Digest and founded by the New Haven (CT) Bird Club. The Big Sit! is like a Big Day, or a bird-a-thon in that the object is to tally as many bird species as can be seen or heard within 24 hours. The difference lies in the area limitation from which one can observe. This area limitation is a real or imaginary circle 17 feet in diameter. People can sit or stand inside the circle and count all the bird species that can be seen or heard from inside that circle throughout that one day. 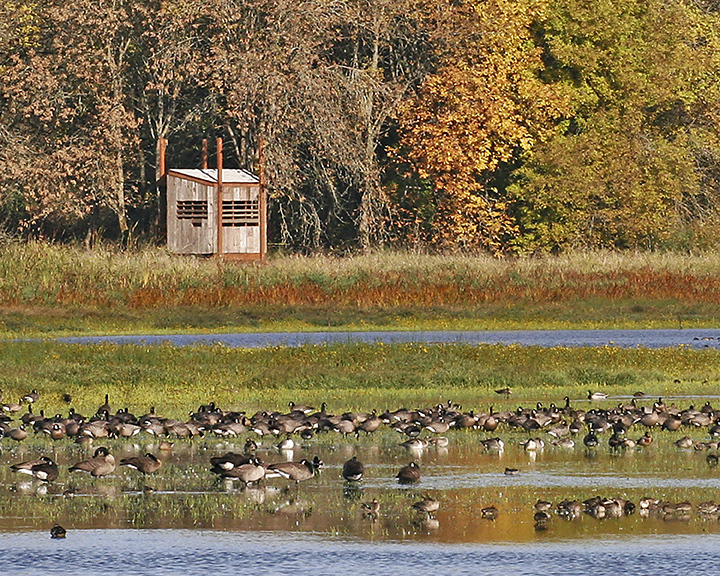 For BirdFest that circle centered on the Observation Blind at the River “S” Unit of the Ridgefield National Wildlife Refuge. Randy Hill, Deputy Project Leader for the Ridgefield NWR, hosted the event at the blind. He reports that 113 people participated through the day with 46 different species being seen. He says that nearly twice as many people came this year to participate but the total number of species seen was down from the upper 50’s last year. All in all, though, it was a good, fun day looking and listening for birds. For those who would like to know more about the Big Sit! and check out the statistics, go to the website http://www.birdwatchersdigest.com/bwdsite/connect/bigsit/index.php. On another note–I have been writing the Refuge Ramblings for the Friends’ Newsletters for five years now and I have covered many topics about the refuge and the wildlife that is found there. For those who would like to check through the archives of these ramblings, especially the ones about wildlife, you now have a chance to do that by going to a blog that I have created called “Ramblings.” This is a blog that will not only have most of the Refuge Ramblings but many of the ramblings will have photographs of the wildlife that is the focus of the article. This blog will also host several Galleries with photographs primarily of the wildlife of the refuge, but also from some of the other places I have visited. If interested please go to blog.windemuths.com. 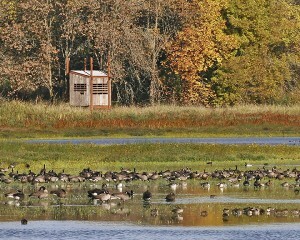 Some of the interesting, unusual, and rare birds that have been seen at the refuge these past six weeks are: Greater White-fronted Goose, Snow Goose, Brant, Eurasian Wigeon, Horned Grebe, Green Heron, White-tailed Kite, Red-shouldered Hawk, Sharp-shinned Hawk, Cooper’s Hawk, Merlin, Peregrine Falcon, Black-bellied Plover, American Golden-Plover, Lesser Yellowlegs, Baird’s Sandpiper, Pectoral Sandpiper, Dunlin, Short-billed Dowitcher, Eurasian Collared Dove, Rufous and Anna’s Hummingbirds, Lewis’s Woodpecker, Hairy Woodpecker, Pileated Woodpecker, Vermilion Flycatcher!, Black Phoebe, & Townsend’s Warbler. Vermilion Flycatcher Note: Most people who think about the Vermilion Flycatcher visualize a red and dark brown bird. This unmistakable coloration is the coloration of an adult male. 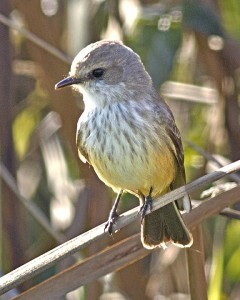 The bird that I photographed at the refuge is a first year female. As the female gets older, the yellow wash on the bottom part of the breast and belly turns pinkish. 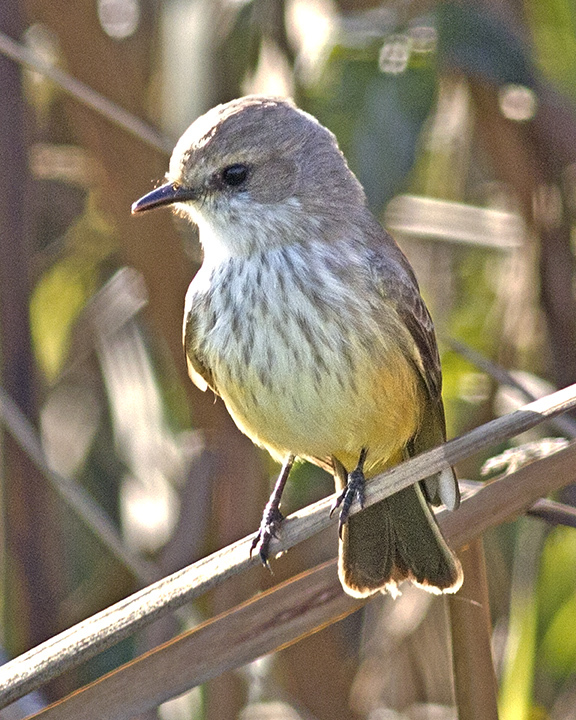 The Vermilion Flycatcher is a rare bird in the Northwest and at the refuge it is listed as accidental. The last one seen was over 10 years ago.